High alcohol barrel aged beer tends to age well and can turn into something much more than it originally was. 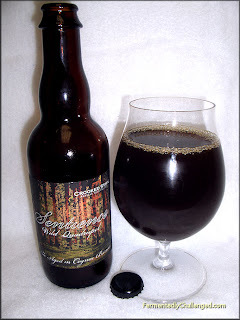 In this particular case, a beer that was released back in October 2012 and kept in the bottle for an additional 6 months was opened for this review: Crooked Stave Artisan Beer Project Sentience Wild Quadrupel - an ale aged in Cognac barrels. This brew was part of the Crooked Stave Cellar Membership distribution from 2012. I have had a couple of opportunities to sample this beer from Crooked Stave. The first time was at the 2012 Great American Beer Festival where it won a Silver medal in the Wood and Barrel Aged Sour Beer category. The second opportunity was at the 2013 Big Beers, Belgians & Barleywines Festival in Vail in January, only that time, they had a Bourbon Barrel version of this beer. Both version I recalled were absolutely wonderful, so I was excited to see how a bit of extra time would treat a 375ml bottle of this brew. 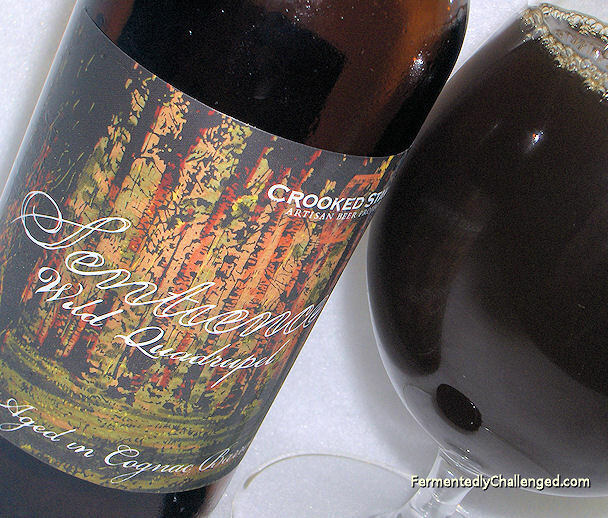 Later on, in February 2013, Crooked Stave released a Leopold Bros. Whiskey Barrel small batch version of Sentience. Sentience (Cognac barrel) weighed in at 11.5% ABV and was aged for nearly a year in those Cognac barrels before getting released. Only select draft customers, beer festivals and cellar reserve members had access to this beer, so it was a bit hard to get in public. So lets see what time did for this beer. Appearance: As I opened this capped bottle, I heard absolutely no hiss. Did this mean that the beer had lost most of its carbonation? The beer poured a dark reddish brown color with golden reddish tones along the edge of the glass. There was hardly any head on this beer, even when poured aggressively. The small light brown head dissolved almost immediately. What bubbles that were there were larger than normal. I saw a bit of sediment pour into the glass near the end of the bottle. I couldn't see through much of this beer as it was not filtered. Aroma: This version of Sentience had a noticeable Cognac aroma along with characteristics of the wooden barrel it came in. I could also pick up hints of dark fruits and the unmistakable aroma of Brettanomyces which imparted tart and sour tones in the small. As a sour beer and barrel aged beer lover, this beer had a simply wonderful aroma. Just as I remembered. The barrel tones had not diminished in the last 6 months. The Brett had subsided a bit in the nose, but I could still make out this was a barrel aged sour. Taste: It was obvious that this beer had lost what little carbonation it may have had, but that didn't take away anything from the big tart stinging flavor this beer had. This beer was sour & tart with a hint of fruit and semi-sweet malt. The beer had a bit of a bite on the forefront from the acidic tones and left a sour, drying sensation on the tail end. I could also pick up a bit of Cognac flavor in this brew as well. The wood had also given this beer a nice woody characteristic. But the main feature of this beer was its bitter, yet tart taste. I was an instant fan of this all over again. On a sour scale from 1 (low) to 10 (high), this one ranks a 9. Overall: If I had to purchase bottles of this beer all over again, I would have bought an entire case of it if I could. This is one of my favorite beers so far from Crooked Stave. It hit all the right sour buttons with me and its one I could enjoy over and over again. It is a strong beer, however, so beware of its power. One 375 bottle is plenty for one seating. My hats off to Crooked Stave. I can see why this beer won a medal at the GABF this last year. I'm hoping they continue to experiment and put out even more of this brew. Well done. A top pick! Disclosure: I got this bottle as part of the Crooked Stave Cellar Reserve Membership I paid for in 2012.